This weekend we’re celebrating Joe’s birthday and we both got the best present ever on Friday at the doctor’s office when we learned that we’re having a BOY! I was convinced it was a girl because both of our families are full of girls but I’m thrilled! Having a son is going to be a whole new world and I’m happy to remain the only woman in the house. 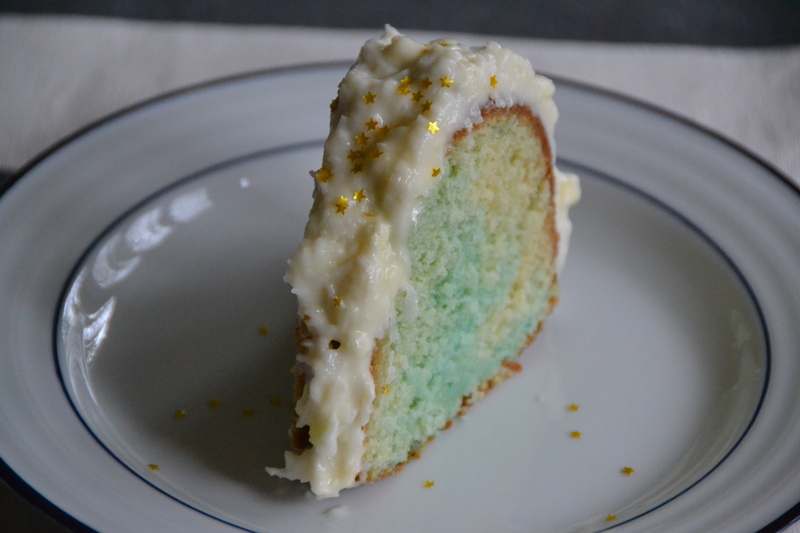 To celebrate Joe and the the little man on the way, I made a decadent blue coconut cake that looks disastrous (how’s that for honesty on a food blog?) but thankfully still tastes pretty good. The trouble started after I planned to make coconut cupcakes but realized at the last minute that my muffin tins didn’t make the trip from VA to NC. I used a bundt cake pan instead but didn’t vary the recipe. I promise I sprayed the pan well but half of the cake stuck when I tried to flip it out. I did some surgery to cover the uglier bits with icing and served already sliced to hide my handiwork. 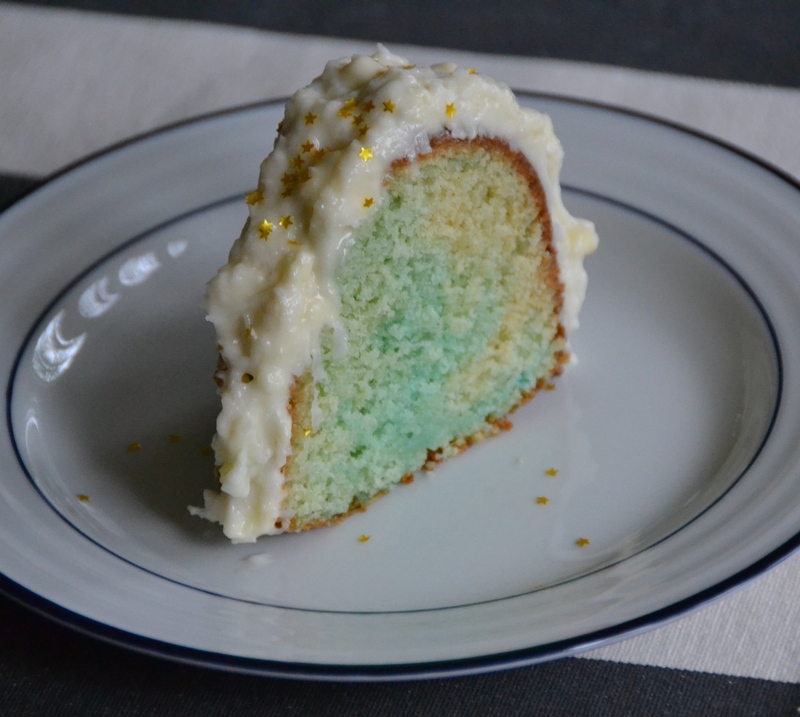 Admittedly, I’m a huge cheese ball so I also wanted to dye the cake according to baby news but my Target didn’t have food coloring so I picked up some blue jello mix and using the zebra cake technique I found here, tried to give the cake a marbled look. It sort of worked (!?) 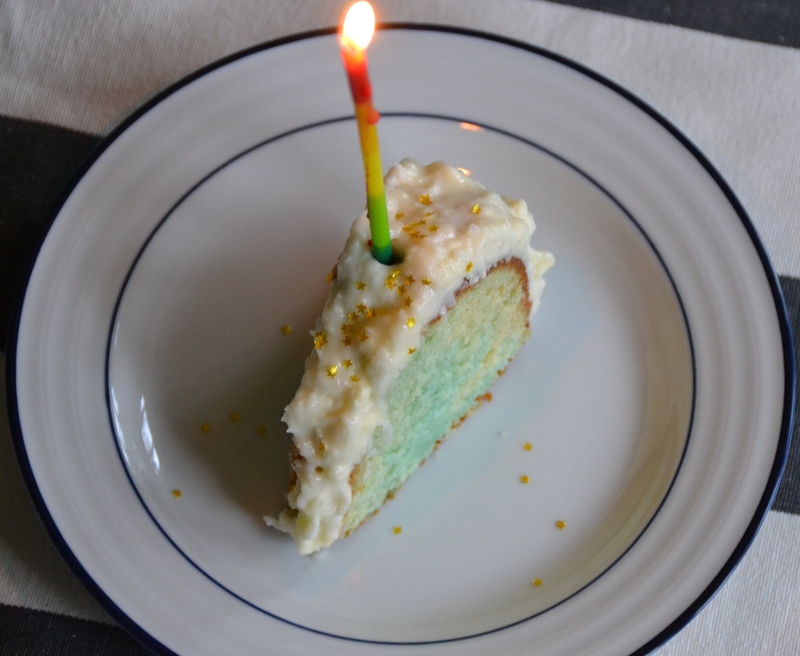 and the cake has a slight blue tint and subtle blueberry flavor. I sprinkled the top with edible gold stars to make it festive and served with blueberries. I hesitate to share the recipe as the finished results aren’t beautiful but decided to post anyway because it tastes great. If you decide to make this recipe I’d recommend making cupcakes or using 9 inch cake pans to make a layer cake instead of a bundt pan.